You have Willard check around in the stalls. You don't see anything too notable. The cabinet door under the sink is fairly light; it takes a little effort, but Willard manages to push it open and squeeze inside. There's a few cleaning products, including aerosol deodorizer, a drain opening tool, and spray bottle filled with a bleach mix. After having Willard push his way back out from under the sink, you also have him check the door. The door swings outward from here--you think Willard could push it open and leave easily enough, but getting back into the restroom may be more difficult. I think we should go back in the pipes and take the one that went down (I think it was blue). I don’t that putting ourself out in the open would be a good idea yet. Is the drain tool something long and plastic we can take with as a possible climbing aid or is it useless to a rat? Go and take drain tool (if useful) back to the slippery pipe. 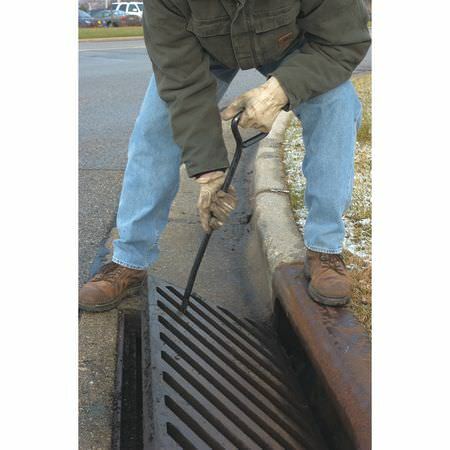 The drain opening tool resembles a metal hook with a grip, about like this. Thank you. Not useful right now. Note: half of a bleach ammonia "bomb"
While I want to explore the other pipes, I want to get back out still. Loosing Willard is "acceptable" but foolish action is not. I'm going to say it's more important to find the Brain Beast than to scout around. With that in mind, I'd rather not risk having Willard go out in the open with possibly no way to return safely. I think we should go back and explore down the blue pipe now. We can look at topside by human (or cambot). The main thing for Willard to do is locate the Brain Beast and possibly Zene's mom (or determine if they're in the same area). Seconding this. Willard will be able to find his way out. Rats can squeeze through absurdly tight spaces and go just about anywhere. Hmm, we need to find where they moved blobby so we can blow it up. The current guess is down the blue pipe, I hope we're right. I wouldn't be opposed to this just to keep the door propped open while we look around right outside. Though if we can do it with something smaller (that could be excused as being dropped and left unnoticed by someone) it'd be preferred. A rat being clever isn't something out of the ordinary but I'm still concerned about raising mental alarms from paranoid Thale zombies/cultists. Oof, we're finding a lot of one-way paths here. How about we go back down and investigate the yellow pipe we found below?